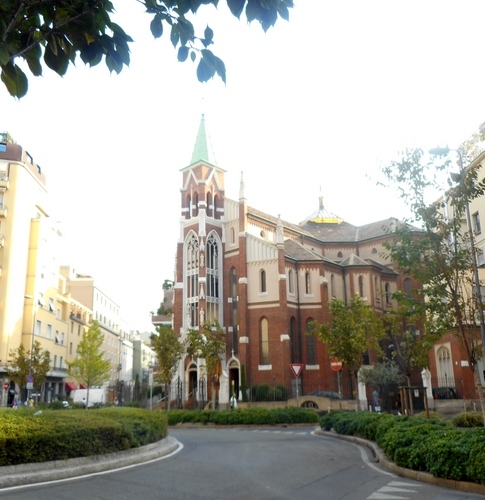 Near the hotel where we stayed in Milan for our Expo 2015 visit is this church. It’s a sanctuary dedicated to Saint Camillo de Lellis, the patron saint of the sick and the staff that look after them. With Milan’s enormous wealth of churches from romanesque (Sant’Ambrogio), through gothic (the Duomo), the baroque (San Giuseppe) and stile liberty ‘art nouveau’ (San Gregorio) it may seem odd to dwell on this church but San Camillo has a particular resonance in my past and is well worth a visit if you are in the area between the Stazione Centrale and Porta Venezia, a part of the city especially rich in art nouveau buildings. San Camillo was completed in 1912 and signalled the return of the Camillan order to Milan after its suppression during the Napoleonic era. The church was designed by the Milanese, Monsignor Spirito Maria Chiappetta (1868-1948), official architect and engineer to the Holy See under Pope Pius XI, who reigned from 1922 until his death in 1939. San Camillo is perhaps Chiapetta’s masterpiece. The church is built in an art nouveauish neo-gothic style and is prefaced by a brick campanile spire with marble niches. There are some beautiful tri-partite lancets and a gorgeous rose window. Six marble statues by Mario Pelletti grace the exterior. 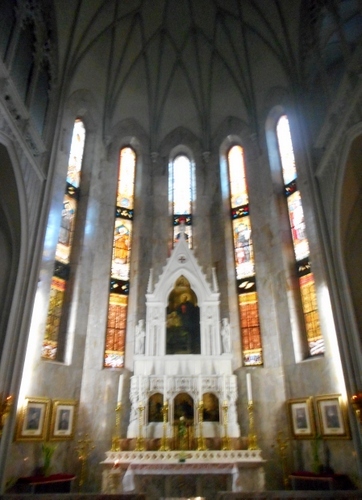 The interior is in the form of a Latin cross and consists of a nave and two aisles. It’s richly decorated with figures of saints and 123 stained glass windows by Cisterna. San Camillo is represented by his own specially dedicated altar to the right. A stunning feature is the recently restored stained glass semi-dome covering the crossing and creating a wonderful lighting effect. The aisles have clerestories above them, empty except for those on either side of the main altar which are fitted with an organ built by Tamburini in 1952. Tamburini was a famous firm, which also built Italy’s largest organ (ordered by Mussolini himself) in Milan cathedral and the one in Florence’s Santa Croce basilica. Sadly, the Tamburini folded in 1996. An unusual feature of the sanctuary church is the processional way rising up behind the altar and leading to the chapel of the Madonna della salute. (Madonna of Health) with its richly ornamented altar. The wooden Via Crucis contains over 500 figures sculpted by Friar Pagnone from Monza and is truly marvellous. San Camillo is just another, apparently unassuming, church in Milan which no tourist would really bother to look into among the plethora of the city’s more ancient, more elaborate and larger religious buildings. 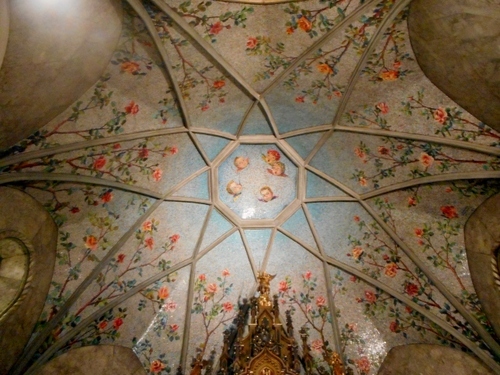 But, as I have stated, it holds a special significance for me and, returning to it, I was at last made fully aware of the rich beauties of the sanctuary’s decorative details and the elegance of its architecture. This entry was posted in Architecture, Art, Churches, Milan by Francis. Bookmark the permalink. the Milanese treasure trove of architecture!! I’ll go next time I’m there. Absolutely divine and your photos are stunning. Thanks. Milan has a special place in my heart. It was a gem to be discovered and a delight to visit despite sore feet from Expo 2015 truly arts and crafts aplenty to see and enjoy I particularly love the rose on the vaulted ceiling and the carved pieces very beautiful indeed and laborious labour of love as it is a very long process to carve such brilliant figures and scenery! The church is very well lit due to the numerous windows allowing the light to flow through and around a true delight that uplifted our spirits!